Based in central New Jersey, Caritas Chamber Chorale was founded by Barbara Sanderman in 2005 for the purpose of presenting a series of concerts of a cappella sacred music to raise funds for the Adorno Fathers' St. Francis Caracciolo Mission, Democratic Republic of Congo, Africa. Since then, the Chorale has continued to support the African Mission. As of 2011, funds have specifically been dedicated to the the Mission's Gianni Diurni Primary School in Goma, DRC. The name Caritas Chamber Chorale was chosen to reflect the group’s desire to emulate the greatest of the Christian virtues: love. (The Latin term caritas is translated "charity" or "love.") The singers, who come from various communities and faith traditions, are united in their shared love of choral singing and their desire to aid those in need. The founder and director of the group, Barbara Sanderman, has a long history of supporting the African Mission through music and in other ways. Ms. Sanderman was assisted in developing the Chorale by Wayne Dietterick and Stan Szalewicz. Mr. Dietterick also serves as Composer in Residence and Assistant Conductor for Caritas. In June of 2005 the Chorale gave its first series of three concerts in Central New Jersey, benefiting the Malnutrition Center of the African Mission. Since then the members of the Chorale have expressed a desire to continue to sing together for the love of the art of sacred choral music and for those in need. In November 2015, Caritas Chamber Chorale made its New York City debut at St. Luke Church in Whitestone, NY with the program Journey On!. Later that month, Caritas toured San Francisco and the northern California Missions, performing at St. Mary's Cathedral and Grace Cathedral in San Francisco, Mission Dolores, Mission Santa Cruz and Mission San Jose, and the Veteran's Home of California, Yountville. Caritas was grateful to be able to share its music and its mission and to create awareness of the needs of Africa in these varied places. In December 2014, Caritas Chamber Chorale was invited to sing for The Joy of Advent Retreat presented at St. Joseph Church, High Bridge. The group was delighted by a visit from the Father General of the Adorno Fathers, who was in attendance at the concert and gave testimony to the importance of the work that Caritas has done for the African Mission. 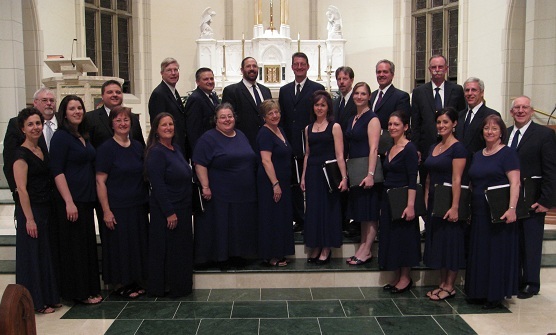 In March 2014 Caritas Chamber Chorale was honored to be a part of the concert series presented by Music in the Somerset Hills, presenting the program Our Hearts Are Filled to Overflowing. Music in the Somerset Hills' organist, Brian Harlow, joined Caritas for this program. In December 2012, Caritas Chamber Chorale was invited to sing as one of the featured guests on the Christmas program of the First Baptist Church of South Orange, NJ, entitled Unto Us Salvation Is Born. Caritas Chamber Chorale extends its thanks to First Baptist Church for partnering with us in supporting the African Mission. Just prior to that, Caritas sang Journey Into Light in November 2012 which contemplated our passage into eternal life and honored those who have gone before us. It featured the Rheinberger Requiem in Eb, the first complete major work performed by Caritas. Performed just days after Superstorm Sandy hit New Jersey, it was a fitting tribute to the loss all experienced and a reminder to put our trust in God. Caritas Chamber Chorale toured Washington, DC in October 2010, presenting the program Love Sings On at venues such as The Basilica of the National Shrine of the Immaculate Conception, the Washington National Cathedral and St. Patrick's Church (the oldest Catholic Church in DC). Prior to the tour, in May 2010, the group collaborated with The Trenton Capital Singers in Wondrous Love. Caritas Chamber Chorale was privileged to sing with the Metuchen Diocesan Chamber Choir at the 2008 National Pastoral Musicians (NPM) Eastern Region Convention. Caritas also participated in the 2007-2008 Adorno Fathers' Jubilee Year Celebration with a concert at St. Joseph Church, Lodi.